A key constraint in network flows is that each arc has a capacity — the maximum amount that can be transported across the arc in a fixed period of time. The maximum flow problem is to determine the maximum total amount that can be transported across all arcs in the network, subject to the capacity constraints. The first person to study this problem was the Russian mathematician A.N. Tolstoi, in the 1930s. 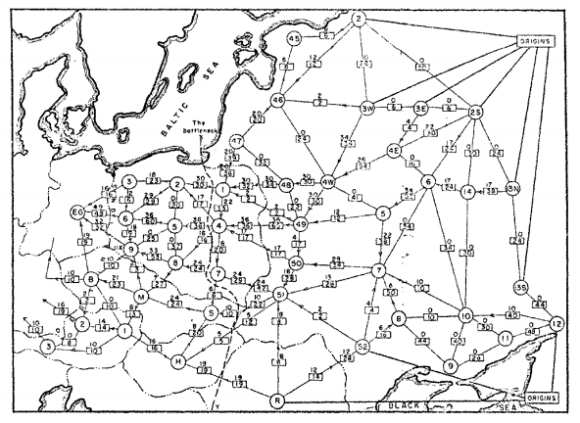 The map below shows the actual railway network for which he wanted to find a maximum flow. OR-Tools provides several solvers for network flow problems in its graph libraries.